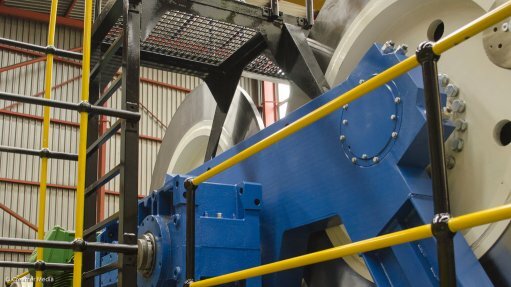 South Africa’s first locally designed and built mobile rope-handling system, designed for installing both head and tail ropes onto a four-rope Koepe friction winder, is ready to be used at platinum miner Wesizwe Platinum’s Bakubung mine, in the North West, mining equipment manufacturer Tech Edge Group tells Mining Weekly. 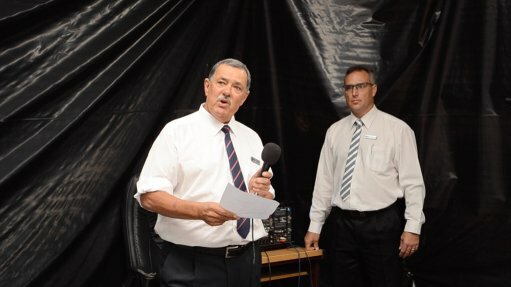 “We completed the equipment this year, organising a small event in February to showcase the completed project and to demonstrate the capability of our company in the rope-handling market, as our company is primarily known for producing winches and larger winders used extensively in the mining industry,” says Tech Edge MD Bannister Erasmus. He explains that, while several single and double rope-handling systems have been manufactured locally, the new four-rope system has been entirely designed and manufactured in South Africa by Tech Edge in collaboration with automation company Schneider Electric, based in Midrand, Johannesburg. The rope-handling equipment serves to increase the rope tension during winder roping up from 10 kN to 200 kN, working by means of a double 1.5 m friction drum system. The equipment is capable of roping up both Koepe and drum winders. A well-known consulting firm handled the tender process and placed the order with Tech Edge, with the production phase of the product started in mid-2016. Manufacturing of the system was completed in February. Erasmus points out that the delivery of the system, as well as its installation and commissioning at Bakubung mine, is planned for mid-year. The operation of roping up the Koepe winder is a slow process, requiring a rope speed of 0.5 m/s. Erasmus explains that attention must be paid throughout the process to ensure all necessary safety criteria are met. The electrical system monitors both the low- and high-tension sides of the ropes and dynamically adjusts for any differences mechanically. A team has been assembled to cover all the required disciplines to operate the equipment and ensure the safe installation of the ropes on the Koepe winder, as well as the drum winders at the Bakubung mine. The control system that monitors the progress of the winding operation was supplied and installed into a trailer-mounted container by Schneider Electric for ease of transportation and deployment. He points out that Schneider’s experience with electrical systems of this nature and its close relationship with Tech Edge made the company a good fit for the project. The trailers for both the control system container and the rope tensioner were designed and supplied by trailer manufacturer Martin Trailers according to the requirements, while Tech Edge handled the integration of the equipment with the trailers. Both Schneider and Tech Edge have personnel readily available for deployment to the Bakubung mine during the full programme of the rope installation and will provide all necessary support as required. Erasmus highlights that all spare equipment for the rope-handling equipment was supplied by Tech Edge. The cost of all critical replacement parts was included in the original scope of supply and will be delivered to the Bakubung mine with the main equipment. “The equipment is manufactured to the highest standard with spares supplied for any unlikely future requirement,” concludes Erasmus.